PROVENANCE: YOSHIDA FAMILY INVENTORY OF UNSOLD PRINTS. Title: White Plum In the Farmyard. Medium: Woodblock Print – Originally printed in 1951. Signature or Seal: Stamped Signature. Image Size: 14.5 X 9.6 inches plus full margins. Condition: Excellent condition, Never framed. PLEASE VISIT MY STORE: JAPANESE PRINTS. The item “TOSHI YOSHIDA Japanese Woodblock Print WHITE PLUM IN THE FARMYARD” is in sale since Tuesday, August 14, 2018. 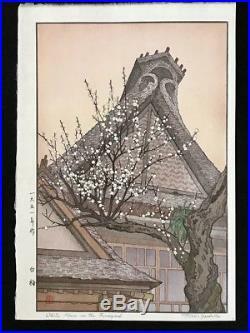 This item is in the category “Collectibles\Cultures & Ethnicities\Asian\1900-Now\Japanese\Prints, Paintings & Posters”. The seller is “hangadealer” and is located in Tokyo. This item can be shipped to North, South, or Latin America, all countries in Europe, all countries in continental Asia, Australia.